Beer, Beats & Bites has chosen fruit beer for The Session #6. I wish I would have had the foresight to brew a beer with some fruit. Hmmm...I'll just have to taste somebody elses. Catch you later tonight. Watch for comments here and a round up over the weekend. Looks like Greg posted tonight as well. Watch this post for some more comments. I thought it might be interesting to try two beers that were quite possibly completely opposite, but still have something in common. Both Abita's Purple Haze and Lindeman's Framboise Lambic have raspberry flavors, but, that is pretty much where the similarities end. Purple Haze was first in the line up. ('cause I know I like the Framboise better ;-) The color is straw yellowish orange with a very soft large head of small bubbles. It's nose is kinda earthy and yeasty. Not unexpected for a wheat beer. It has a hint of raspberry on the nose as well as on the tongue with the fruity wheatness you would expect from a wheat beer. Very drinkable and pleasant. Some uninitiated might baulk at the nose, but, it smells better than most popular macro beers. This could be a chick beer. Take note men. Ok, it is a dark purple with a good head that dissipates to a velvety blanket. The color is reminiscent of raspberry jam. The nose is well just as light and fruity as the fruit itself. Now for the taste. I should note that this beer is now at room temperature. It's taken that long for me to get to it :-) Oh back to the taste. Imagine a raspberry sauce served with cheesecake. That's it. Sweet and tart with almost all the characteristics of the fruit itself. I've often thought of beer as liquid bread. Well this is liquid dessert. Liquid raspberries for the gods! Sheesh...sometimes a beer just moves ya. I like to bring things down to earth. So here it goes. You walk into a bar. You ask the bartender if they have any raspberry beer. (you heard about it from your friend) You get to choose between Abita's Purple Haze Raspberry Wheat Brew and Lindemans Framboise. First you'll need to get past the price difference. Then what? What would you choose? Well most people won't get past the price difference. At three times the cost Lindeman's just isn't in the same league. I've been known to put taste above price before. Which would I choose? Duh...the Lindemans. Which would most people choose after tasting both? Purple Haze, it is more drinkable as an entry level beer. Lindemans Frambois would be more appealing to somebody who is exploring the beer world. Although it is a bit sweet for my taste, it is delicious. There is no doubt about it. How do they do this? Evidently barley malt, unmalted wheat, raspberries and spontaneous fermentation. Damn. I gotta try this with my hombrew. I wonder what kinda spontaneous fermentation I'd get out here in Southeastern PA? Not sure I wanna find out. One last point. Does fruit and beer go together. Most people would say no. Most beer people would say yes. There is room to grow in this area. I think there are more people out there who would be interested in fruit beer if they weren't stuck with all those so so raspberry or cherry wheat beers. The world needs to be educated! If you're around, I'll give a shout! Interesting. 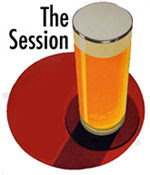 New Glarus came to my mind when I read about this months session. Great minds think alike. We have a picnic to go to. I'll be around after that.